The Bevel range has an exclusive bevelled frame design with mitred corner joints, angled feet and brushed metal handles, in our stunning natural oak finish. Named after its exclusive bevelled frame design with mitred corner joints, the Bevel Range combines the traditional charm of good quality natural solid oak with a sleek, refined modern styling. 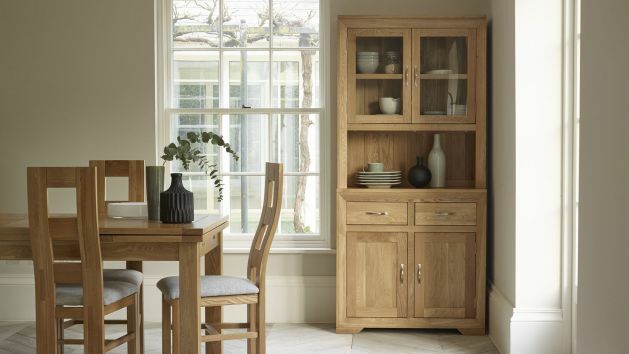 As with all of our ranges, each piece within this range is designed to match and complement the other pieces within the range and all of our other natural oak furniture ranges. As is standard with all our furniture, each piece is crafted by expert joiners from the finest cuts of premium grade solid oak. Time-honoured techniques, such as the dovetail joints and solid oak runners on all drawers, ensure that the furniture is exceptionally robust and durable – so you can enjoy it for many years to come. In addition to the bevelled frame, the design features elegantly angled corner feet and brushed metal handles, which lend themselves wonderfully to the contemporary ambience of this collection. These features are universal across the entire range, so it’s even easier for you to maintain a continuity of style throughout your home.